Bidvest Foodservice held a two-day conference and teambuilding event at Alton Towers Resort in June, hiring out the newly opened Rollercoaster Restaurant. The event ran for 190 guests in total, with 70 delegates on the first day, and 120 on the second day. The event was a chance for teambuilding and internal business updates, followed by suppliers joining the teams for networking and reviewing prospects. The company needed to update the teams on latest activities and performance, as well as providing time for networking with key suppliers and discussing new opportunities. The Stateroom was chosen as it was a great space the event, with sectioned off areas available. Tony Ball, director of sales at Bidvest, said: "We have made our own treasure hunt around the park. The events department was very helpful in letting us do this and making us aware of what we were and were not allowed to do. The Secret Garden restaurant was very flexible in letting us have our own icecream brand too." Guests attended conferences in the Stateroom on both days with activities including an afternoon teambuilding treasure hunt and meals in both the Secret Garden and the Rollercoaster Restaurant. Speaking about the event, Ball said: "The Alton Towers team was as helpful and flexible as ever, particularly as we had quite a complicated two day conference agenda. I would have no hesitation in recommending this venue for future conferences. 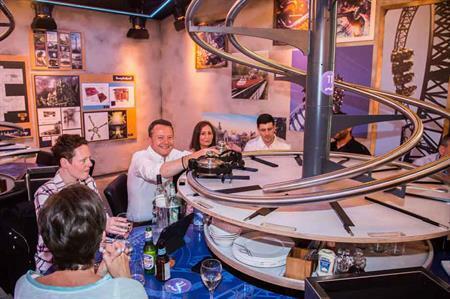 The Rollercoaster restaurant is a great family restaurant and will no doubt be hugely popular."